Mailbox . . . Tuesday? Yay!! I got some books. Mrs Craddock, by W Somerset Maugham: You may remember that I got a copy of this book for my birthday BUT it was in German. A language that I cannot speak, let alone read. So my mom graciously offered to order another copy for me. I got it this week! Cloyne Court, by Dodie Katague is for a blog tour in November. It is supposedly similar to Animal House, and the salaciousness of a good college story is more than I can pass up! Everything We Ever Wanted, by Sara Shepard is also for a blog tour. It deals with hazing and the cover is deliciously fall like, with the beautiful orange-y colors of leaves. 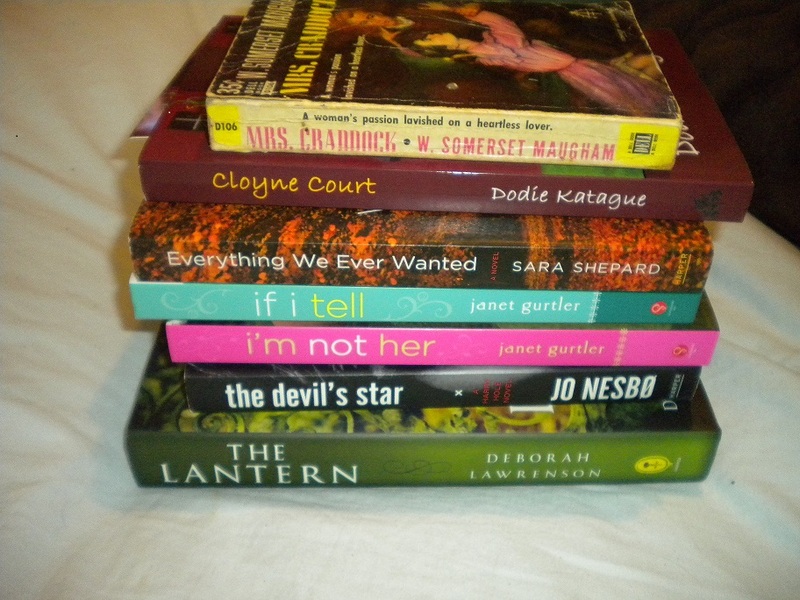 If I Tell and I’m Not Her, both by Janet Gurtler: These are both YA fiction sent to me by the publisher. I feel like I haven’t read much YA fiction in the past few months, so I was glad to receive these. The Devil’s Star, by Jo Nesbo: I have finally done it! I bought a book of Nesbo’s. Now I just have to read it. I gave up trying to determine the order of Nesbo’s books, so when I saw this one at the table at Barnes & Noble, I grabbed it. The Lantern, by Deborah Lawrinson: What can I say . . . this has been on every blog lately, it seems. I was not sure whether or not to pick it up at first, but then I got curious. Plus, Carl is hosting a readalong for RIP, so that was just the push I needed! So tell me, which of these books have you read? Which would you like to read? Mailbox Tuesday works…I love IMM posts. Great selection of books. I would love to read Everything We Ever Wanted, and the Lantern. I really want to read The Lantern it looks chilling and atmospheric and awesome!! The people translating Nesbo have given me a major screwing. I thought The Redeemer was the last one in the series, but The Snowman is. So when I read TS, all kinds of stuff were totally spoiled!!! I feel cheated, but I will still read backwards. I think you should like The Devil’s Star. I couldn’t put it down. I haven’t read any of them, although The Lantern is on my list. I just have to read Rebecca first! The only one I’ve read is The Lantern. It was good and you don’t need to read Rebecca first. I’m going to try and stop by the read along since I just finished the audio book last week. I just got The Lantern in the mail today too. I’m very excited for the reading group! I’ve heard great things about The Lantern. Enjoy your new books! Everyone seems to love Nesbo’s work. I have one of his books, but haven’t tried it yet. I’ve heard good things about The Lantern too. Wow, you have plenty of great looking books to keep you busy for a while. Looking forward to The Lantern. I’m going to try my first Nesbo soon … and like you, I struggled to figure out the order. I determined the first one I could find was The Redbreast. Why is this so hard?? ?